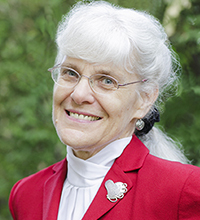 Elsie Anne McKee, Archibald Alexander Professor of Reformation Studies and the History of Worship, earned her PhD at Princeton Theological Seminary and the Diploma in Theology from Cambridge University in England. The history and theology of the Reformation are the focus of her research, along with a strong interest in cross-cultural issues developed by experience in central Africa. Themes include the history of Biblical exegesis and spirituality and women in the church. Rare book rooms and archives (Geneva, Strasbourg, Zürich) have been keys for the “delight of digging in 16th c. dust,” producing studies of theological issues, biographical explorations, and editions of texts. One focus is Calvin’s doctrine of the church: John Calvin on the Diaconate and Liturgical Almsgiving (Geneva: Droz, 1984); and Elders and the Plural Ministry (Geneva: Droz 1988); and Calvin’s Pastoral Theology (in Korean, Seoul, 2011), and her newest book, The Pastoral Ministry and Worship in Calvin’s Geneva (Geneva: Droz, 2016). Another story line reveals a remarkable woman reformer, Katharina Schütz Zell: The Life and Thought of a Sixteenth-Century Reformer (Leiden: Brill, 1999). Other goals include providing more access to the reformers through translations and editions: John Calvin: Writings on Pastoral Piety (Classics of Western Spirituality, Paulist, 2001) and John Calvin: The Institutes of the Christian Religion. Translation of the French 1541 (Eerdmans, 2009). Katharina Schütz Zell. The Writings. A Critical Edition (Leiden: Brill, 1999) and Katharina Schütz Zell: Church Mother: The Writings of a Protestant Reformer in Sixteenth-Century Germany (Chicago: Univ. 2006). An on-going project is a critical edition of Calvin’s manuscript sermons on 1 Corinthians for the Supplementa Calvinana series. A new project is exploring the life and work of Congolese Christian women. Research leads to teaching, the realm for inviting others to the game of historical “Come dig with me: finding out is such fun!” The more players the merrier; learning is for sharing.